One of the items on my Summer Sewing Hit List that I was most on the fence about starting was my personal challenge to myself to "sew something without straight lines". Amanda made me a birdie sling bag last year and I completely adore it. It's the perfect size to carry a work laptop, or use as a gym bag, or just as a general tote around town. I'm pleased as peaches that this project can be scratched off my list and overall I'm glad I conquered a rare feat of pattern sewing for myself. Perhaps the best part of sewing up this bag though was that I reminded myself that I really am not all that into pattern sewing. Amy's pattern was simple, straight forward and easy to use, but I think I'll stick to straight line quilt tops for a while longer. 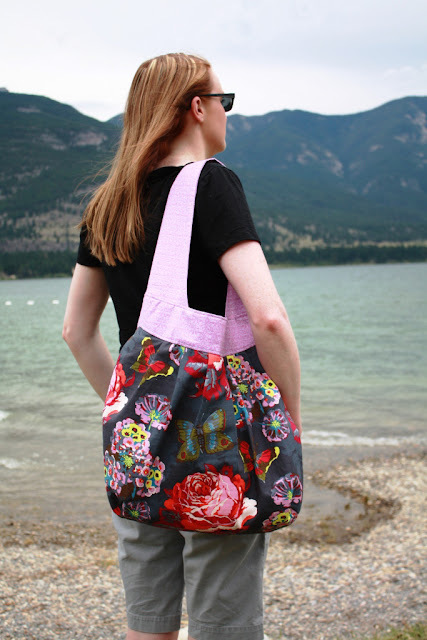 Surprise surprise, the focal fabric used for this bag is another Anna Maria Horner print from Loulouthi (I can't get enough AMH!). The secondary exterior fabric is a print from Jason Yenter's Legendary Basics collection and the lining is a vibrant print from Lotta Jansdotter's Echo line. I can't wait to fill this bag up and take it on a spin around town.